7th September, 2012 marks 100 years since the official opening of the large classroom extension to the original Berowra Public School building. This special old building housed generations of primary school children and teachers till the mid-50s, when finally all the classes were relocated to Hillcrest Rd. Now known as Berowra District Hall and cared for by the Lions Club of Berowra, it continues to welcome a wide range of teachers and students – adults and children, group meetings, flower shows and plays and more. Take a close look at this lovely school photo available courtesy of a senior interviewee. Do you recognise any of the youngsters? Ask your friends and family if they recognise particular children. 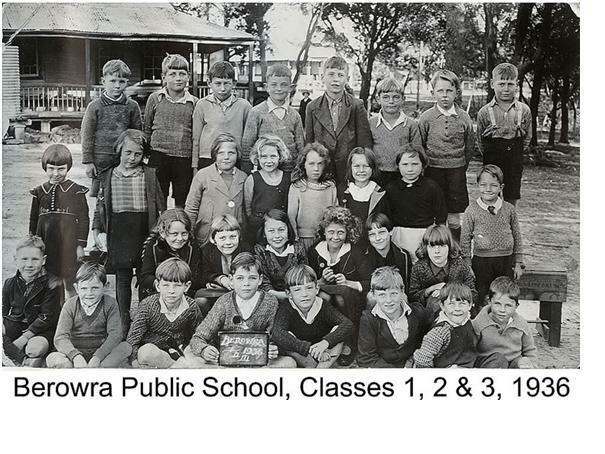 Are they 1936 school bags on the verandah? Who is that woman in the background near the car (?)? Is she an interested passerby or a parent perhaps? We know that in those pre-war years the staff and senior boys at Berowra’s first school were, like many others, very resourceful! Did they themselves make the form on which the back row of boys is standing? Closer inspection of the rotated image may help you to read the brand name on the box used in the carpentry class work! We’d love to hear from you and it would be great if you had more early school photos to share with us all. I wonder which of these children were entertained at a Margaret Preston party for children at her home in Berowra. Hi I am currently the Director of the Berowra District Hall on behalf of Berowra Lions. I am trying to collect information and copies of photo’s for the 100th birthday of the added large room. We would like to celebrate by having a display of photo’s and any information around. Your assistance with the gathering of the information would be greatly appreciated. I will pass your inquiry on to the rest of the team and see what we can do. Hi Ihave in my possesion, a very old form, used at my old Berowra school. I found it about 40 years ago in the bush on the western side, where it had been cast away ,possibly, when the students were moved to Hillcrest School. we have been using this as a seat, at our back door, ever since. I shortened it slightly and , as it had never before been painted, gave it a little brush up. It is still in a rather rustic condition, but can still support bums.